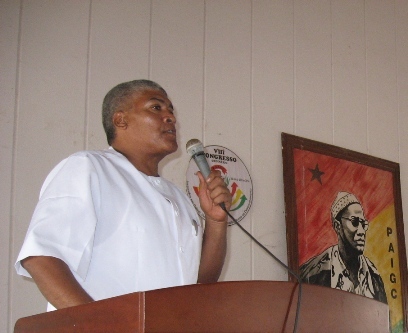 Imani Na Umoja is a Member of the Central Committee of the African Party of Independence of Guinea and Cape Verde, (PAIGC) serving in the National Secretariat of the PAIGC as a collaborator in National Cadre Ideological Training Department. Serves on the Amilcar Cabral African Youth, (JAAC) on its Central Coordination; its National Secretariat as the National Secretary of International Relations and serves as National President of it National Organizing Committee for the upcoming Second JAAC Congress. Also serves on the Central Committee of the All-African People’s Revolutionary Party, (A-APRP) and its Political Secretary for the Central Program Committee and Coordinator of the Brothers/Sisters Organization and Allies Task Force. On the District level of Guinea-Bissau, serves as an activist in the Political Commission of Zone 6 / SAB, for over 24 years. Currently serves as the Coordinator of Zone 6 to Plak-1 Section. Was born on 15 July 1961 in St. Louis, Missouri, USA, and was honored to receive the award for “Future Leaders of St. Louis, Missouri” among all other counterparts presidents of Student’s Associations in the city with over a million inhabitants. After high school was formally educated in the areas of public administration and political sciences (including sociology courses, international relations, international development) at Xavier University in New Orleans, Louisiana, and at the same time served as president of the Student Government Association and on the national level was elected as the President of the National Organization of Black University Students and College Students,(NOBUCS) composed of SGA presidents from all Historical Black Colleges and Universities (HBCUs)in the US. In this capacity, he traveled to almost all the HBCUs in US; attended many conferences (including the United Nations). These experiences have enabled the acquisition of skills in guiding young people with experience in creating groups and training, capacity to plan and implement activities, implementation and project management, monitoring and evaluation of projects. In 1988, after successfully completing Law School at Southern University Law Center in Baton Rouge, with experience as a lawyer and editor of Law Review Journal, he moved to Guinea-Bissau, West Africa to continue to work and study for the organization of the Masses for sustainable development in the revolutionary Pan-Africanist context.